According to the new definition, a person who is unable to count fingers from a distance of three metres would be considered "blind" as against the earlier stipulation of six metres, which was adopted in 1976. 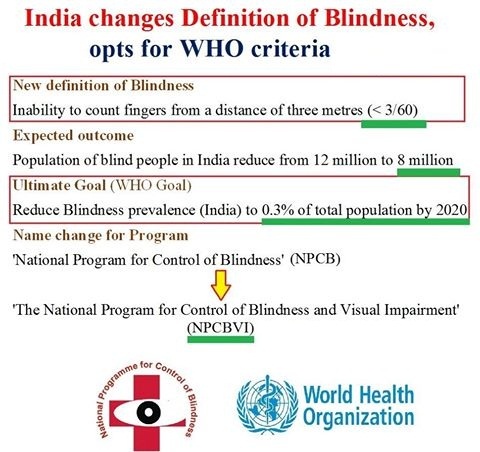 The aim of revising the definition is also to be able to generate data which can be compared with global estimates and achieve the WHO goal of reducing the blindness prevalence of India to 0.3 per cent of the total population by 2020. The notification in this regard has been issued by the Union Health Ministry. Going by the new definition, the population of blind people in India will reduce from 1.20 crore (as per National Blindness survey 2007 data) to 80 lakh. Further, India has to achieve the goal set by the WHO which recommends reducing the prevalence of blindness to 0.3 per cent by 2020 to achieve the elimination of avoidable blindness. Also, the name of the scheme, National Programme for Control of Blindness [NPCB] has been changed to The National Programme for Control of Blindness and Visual Impairment [NPCBVI]. "The probable reason for keeping 6 metres as the cut off distance for defining blindness in India was to include economic blindness cases which referred to a level of blindness which prevents an individual to earn his or her wages. "In contrast, the WHO definition adopts a criteria for blindness that is which hampers the routine social interaction of a person (social blindness),".